William Brodrick’s Father Anselm books never fail to meet my expectations. They are thought provoking and philosophical concerning moral dilemmas and on top of all that they’re crime fiction – an ideal combination for me. The Discourtesy of Death is the fifth Father Anselm novel and there is nothing simple or easy to solve in this book, be it the ethics or the crime, or whether Jennifer’s death was actually a crime at all. Jennifer Henderson, a young woman, an acclaimed ballet dancer, was paralysed after a fall and later diagnosed with terminal cancer. She died and for two years her death was accepted as a peaceful death, a result of the cancer. But then an anonymous letter casts doubt on the matter – was her death assisted suicide, or murder? Father Anselm, the lawyer-turned-monk, is asked by his Prior, who had received the letter, to investigate, even though there is no evidence of murder and on the face of it no suspects. So, this is by no means an ordinary investigation and Anselm has to work hard to get to the truth. Jennifer’s family and friends are the focus of his search and as he reviews the details of Jennifer’s last day he realises that any of them could have done something to her; but who, what and why? The book explores the philosophical, moral and theological issues of the right-to-die, the questions about the nature of life and the choices available, whether mercy killing to stop another person’s suffering can ever be justified. Because of this the pace is slow, almost leisurely, even with the added drama of Jennifer’s father’s actions as part of the SAS in Northern Ireland, which continues to haunt him. I was drawn into some of the red herrings, but in the end it was the question of what Anselm would decide to do with what he had discovered that exercised me. It left me wondering about the issues raised, which are thoroughly explored throughout the book with the implications of the various outcomes clearly stated. And, elevating his mind above carp and trout, Anselm thought that the glory of life – even brief and trimmed down to the point of seeming insignificance – remained utterly breathtaking. That death, with all its power, would always be the one who came afterwards, the latecomer who’d missed the party. 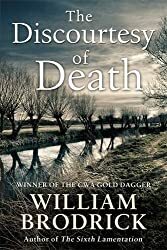 Whilst I don’t think The Discourtesy of Death is quite as good as the third Father Anselm book, A Whispered Name, which I thought was brilliant, it is still an excellent book, that I thoroughly enjoyed. There are five Father Anselm novels, and I’ve read them out of order, so I’ve still got the fourth book, The Day of the Lie left to read. I can’t quite believe it but despite spending many hours in the garden in May mowing the grass and weeding (there are still too many weeds!) I managed to read ten books, bringing my total for the year so far to 45. They’re a bit of a mixed bag of excellent and not very good, with some good ones in between! The Big Four* by Agatha Christie – a bit of a let down, not up to her best! The Dance of Love by Angela Young – her second book due out at the end of July. I loved it! 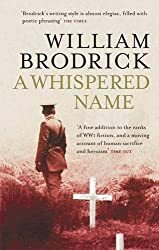 A Whispered Name* by William Broderick – excellent – see my thoughts below. I’m not taking The Dance of Love into account in considering which book is my favourite book of the month because I’m saving my review for July when the book is published – but I can say now that it is brilliant! The Graveyard Book and No Stranger to Death are both really good books and as I was reading each one I thought either could be my favourite book for May but then I read A Whispered Name and that decided it – it is my favourite book of the month and also my Crime Fiction Pick of the Month (hosted by Kerrie at Mysteries in Paradise)! A Whispered Name by William Brodrick is the third Father Anselm novel, which won the Crime Writers’ Association Gold Dagger Award in 2009. I think this is a most remarkable book and it kept me glued to the pages as I read about the First World War and the effects it had on those who took part, those left at home and on future generations. It is, of course, historical fiction. During the slaughter of Passchendaele in 1917, an Irish soldier faced a court martial for desertion. On the panel was a young captain, Herbert Moore, charged with a responsibility that would change him for ever. After the war Herbert became a monk, one of the founders of Larkwood monastery, where Father Anselm came across two visitors, Kate Seymour and an unnamed old man, searching for Father Herbert. But he had died in 1985 and no one could answer their questions about the trial of a deserter, Joseph Flanagan and Father Herbert’s part in it. Father Herbert was revered and loved by all who knew him and Anselm was deeply dismayed at the thought that there was anything in his past that he had lied about and he set out to discover the truth. After the wallop, Herbert found himself prostrate with his face against the dirt, vaguely aware that time had passed, that water was creeping on him; that he would have to move or he’d drown. And Herbert did indeed serve on a court martial that condemned Joseph Flanagan to death. But there is not just the horror of war in this book, it’s an intricate, evocative novel focussing on the themes of morality, justice, sacrifice and human redemption. It is a book above all that identifies the place of the individual within history, written so lyrically putting the past under a searching spotlight. One of the best books I’ve read for quite some time. William Brodrick became a barrister, having been an Augustinian monk for six years (the other way round from his fictional character, Father Anselm). After 10 years at the Bar, his interest in writing led him to writing the Father Anselm books. I’ve now read the first three books and think A Whispered Name is probably the best. I have yet to read the next two – I hope to do so soon.